If you would like information on the Hiclone fuel saver please email us. We have them for sale as well. The Tornado goes into the air intake tube on your vehicle, creating a vortex and helping to improve the air flow to the intake on your engine. These are made of stainless steel and will outlast your vehicle! Drivers who use the Tornado save on the average of 1-2 MPG and gain on an average of 5% Horsepower. Measure your intake tube inside diameter and use the size listed next to each unit from the drop down table for ordering below. The sizes next to each are the smallest they will go, and they can expand a little more than 1/4″. Choose your size from one of the two drop down lists below. We offer exchanges & returns for 30 days. There is an $8 charge for shipping & handling for any exchange, so double check your size carefully. If you need to return for any reason, then contact us first to receive an RMA#. Returns must be made within 30 days and must be unopened and in original packaging, without missing any stickers on Tornado and must be clean and free from dirt/grease. 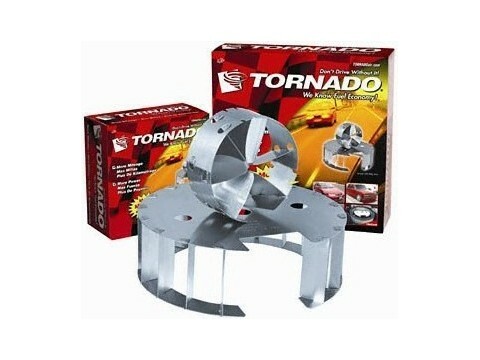 If you return a tornado that is not in original box, is dirty, a different size, or missing stickers then it will be sent back to you and no refund given.